Kirsten joined MTI Physical Therapy’s Fremont team in 2016 after living across the country and the world for the previous 15 years. As a native, she was drawn back to the Pacific Northwest due to her love of living with both water and mountains in her backyard. She graduated from Pepperdine University in 2004 with a degree in Political Science and then later, a Masters in International Relations from the University of Oklahoma (2009) while living in Germany. It was not until her stint working for the American Red Cross with the military in Iraq (2010) and Afghanistan (2011) did she truly discover her passion for rehabilitation. Her experience volunteering at a military field hospital and assisting with aeromedical evacuations in Afghanistan ignited her desire to be involved in the healing professions and prompted her to enter physical therapy school. 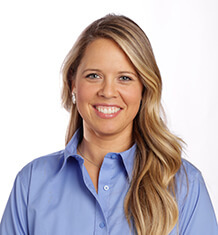 Kirsten graduated in 2016 with a Doctorate in Physical Therapy from the University of Oklahoma Health Sciences Center. She completed her Orthopedic Manual Therapy Residency Program through the Ola Grimsby Institute (OGI) in 2017 and is continuing her post-doctoral education in advanced orthopedic manual therapy with the OGI Fellowship program. Kirsten grew up playing volleyball, basketball and softball in high school and now, years later with aches and pains of her own, has empathy for the injured adult recreational athlete. As a physical therapist (PT) she loves anatomy, kinesiology and movement analysis, but the aspect she loves most about being a PT is the relationships she gets to develop with her patients. In her spare time Kirsten loves to travel, be in the sunshine, and go on adventures with her dog Charlie. She enjoys indoor cycling, yoga, as well as most other group fitness classes as a way to stay active.